Now you can own a part of history with this special release of original authentic US Morgan Silver Dollars from the National Collector’s Mint. These silver coins are between 91 to 134 years old. They have not been minted for over 90 years now and are no longer in circulation. Each Morgan Silver Dollar contains a total of .77344 oz. of pure fine silver. They guaranteed to be in Brilliant Uncirculated to Fine condition. 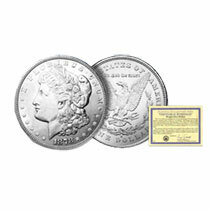 Morgan Silver Dollars are one of the most popular and sought after silver coins in the United States. But over 320 million Morgan Silver Dollars were melted for World War I and World War II and millions more were melted by silver profiteers. Not only will you own a piece of history with the Morgan Silver Dollars but you also have an invest in silver since each coins contains .773 ounces of .900 fine silver. Silver prices has almost tripled in just the last 3 years alone. With every increase in the price of precious metals, a Morgan Silver Dollar will be more and more valuable. The last time the price of silver was $50 an ounce, China was still a poor and underdeveloped country. But now the Chinese are rich and are now using three times as much silver as they did. You can order a Morgan Silver Dollar from the National Collector’s Mint for $39 each plus the cost of shipping and handling. Each coins comes with it’s own Certificate of Authenticity.